Enjoy the ultimate spa retreat in an oasis of beauty and tranquility. Enveloped in total luxury and relaxation, you will feel refreshed and renewed as your worries and tensions slip away. Your stay begins with the peaceful Shirodhara Treatment, followed by a Soothing World Combo Massage, Rejuvenating Facial, Deluxe Pedicure, Slimming Wrap, full body exfoliation, and a long-lasting manicure. Delicious low-calorie spa meals are included during your stay. Enjoy the ultimate spa retreat in an oasis of beauty and tranquility. Enveloped in total luxury and relaxation, you will both feel refreshed and renewed as your worries and tensions slip away. Your stay begins with the peaceful Shirodhara Treatment, followed by a Soothing World Combo Massage, Rejuvenating Facial, Deluxe Pedicure, Slimming Wrap, full body exfoliation, and a long-lasting manicure for both guests. Delicious low-calorie spa meals are included during your stay. Due to the intricacies of these overnight packages, we ask that you contact the spa directly at 843-266-3619, Monday through Friday, 10am to 6pm, to plan your spa retreat. 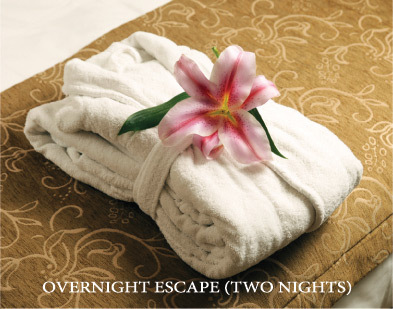 Accommodations included in Overnight Escape packages are complimentary. Additional services or products may be added to your package at a 10% price reduction. Please note that spa services are not available on Sunday.